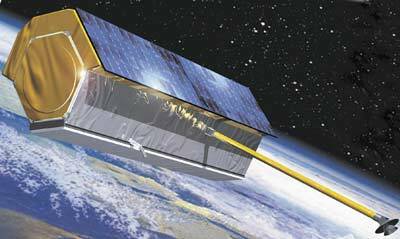 TerraSAR-X is a 1 meter resolution class radar satellite, which delivers Earth observation data for scientific, institutional and commercial users. TerraSAR-X is the first satellite implemented in a Public/Private Partnership in Germany, as EADS Astrium GmbH and the German Aerospace Centre (DLR) share the costs for construction and implementation of the satellite. TOR (Tracking, Occultation and Ranging) experiment, furnished by GFZ Potsdam, Germany. and CSR (Center of Space Research) at UTA (University of Texas at Austin), USA. The TOR payload consists of the dual-frequency GPS receiver IGOR (Integrated GPS Occultation Receiver), developed and built by Broad Reach Engineering Company of Tempe, AZ, and LRR (Laser Retro Reflector) for evaluation of GPS-based orbit data as an independent tracking technique. The German Space Agency DLR on behalf of the Federal Ministry of Economics and Technology and satellite manufacturer EADS Astrium announced at the ILA-Airshow 2006 in Berlin its intention to build a new satellite mission called TanDEM-X. Following the official kick-off, development and manufacturing of the new German radar-satellite will start at EADS Astrium´s Friedrichshafen plant. TanDEM-X is scheduled for launch in 2009. Together with the almost identical radar satellite TerraSAR-X which was launched in June 2007, it will form a high-precision radar interferometer. Like TerraSAR-X, the TanDEM-X project will be carried out within the scope of a public-private partnership between EADS Astrium GmbH and DLR. It settles the utilisation of data for scientific purposes under the management of the DLR institute for microwaves and radar and for commercial purposes, for which Infoterra GmbH (Friedrichshafen), a subsidiary of EADS Astrium GmbH, is exclusively responsible. The spacecraft will cost approx. 85 Mio. , Mio. DLR will finance 56 , EADS Astrium carries 26 Mio.  and three Mio.  will be sourced by marketing of flight opportunities for further payloads. With the aid of the tandem formation TerraSAR-X/TanDEM-X it will be possible to completely measure the Earth's land surface, that is 150 million square kilometers, within a period of only 2.5 years. For a 12 m grid (street width), height information can be determined with an accuracy of < 2 meters. The spanish Paz satellite, owned by the operator Hisdesat, will be located in the same orbit of TerraSAR-X and TanDEM-X. The three satellites, virtually identical, operating in a constellation, providing data to customers more flexibly and effectively with a wide range of advantages like reduced revisit times.